"Anyone who writes the history of twentieth-century America must give a place of honor to Irving Berlin (1888-1989), a musical bard whose work expressed his times as eloquently and unerringly as the poetry of Walt Whitman and the songs of Stephen Foster gave voice to the aspirations of nineteenth-century America. 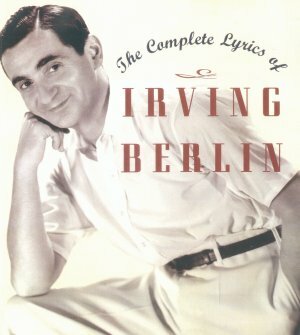 Not only because Berlin is one of our greatest songwriters, but also because he is one of our most important social chroniclers," comments Robert Kimball in the introduction to THE COMPLETE LYRICS OF IRVING BERLIN (Applause Books). Kimball worked with Linda Emmet, one of Berlin's three daughters, in compiling this massive, impressive book (560 pages, including photos and index) which contains every lyric Berlin ever wrote, all 1,250 of them, listed in the chronological order they were written, beginning in 1907 with "Marie From Sunny Italy" and concluding with 1987's "Growing Gray" (when he was one hundred years old). Berlin, who grew up on the Lower East Side and began his showbiz career as a singing waiter, had his own publishing company at nineteen when he enjoyed a huge success with "Alexander's Ragtime Band." Writing for cabaret, Broadway, Hollywood, radio and TV, he turned out such classics as "Blue Skies," "Always," "White Christmas," "God Bless America" and "There's No Business Like Show Business." Berlin, a perfectionist where his work was concerned, collaborated with most of the luminaries of 20th century pop music--Jerome Robbins, Bing Crosby, Ethel Merman, Grace Moore and Ruth Etting, to name but a few. Although he was down to earth and personable, he also suffered from melancholy and became a recluse late in life, largely because his music fell out of favor. "It was as if I owned a store and people no longer wanted to buy what I had to sell," he explained. "Everything changed. The world was a different place. The death of President Kennedy, the Vietnam War, the social protest. Music changed, too. The Beatles and other groups reached audiences I couldn't. It was time to close up shop." Berlin may be gone from the scene, but his legacy will never perish, not when we have books like this to remind us of what a remarkable artist he was.